Fried udon recipe, Malaysian style. Cabbage, shrimp, fish cake in a dark brown sauce serve with cut chilies and soy sauce. Easiest fried udon recipe! Noodles are popular all over Asia, so it’s no surprise that noodle is a staple of many Malaysians. Walk down any streets where there are street vendors or hawkers, you will see that most of the foods sold are noodle dishes. 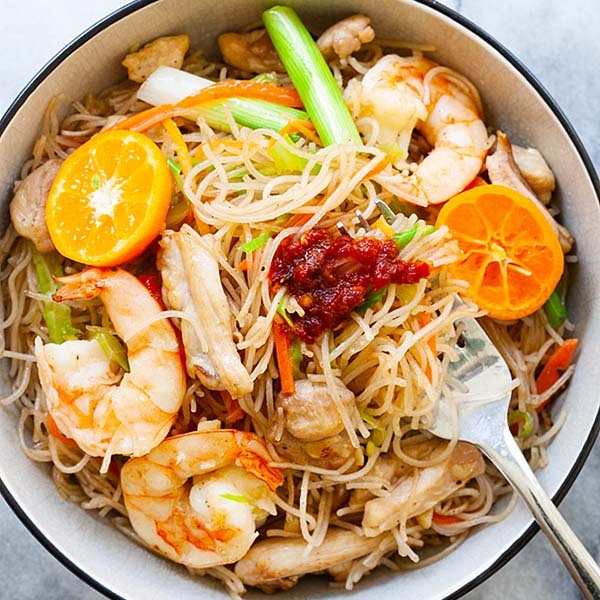 Everyone loves and could always use a noodle dish, regardless of our ethnicity: Chinese, Malays, Indians, or Eurasians. Even the foreign expatriates who live in Malaysia fall in love with local noodles dishes. One of the differences of noodle dishes in Malaysia is the condiment that comes with the noodles. The noodles can be soupy and comes in a broth or soup, or dry as in stir-fried noodles, or in between, such as char hor fun (fried flat rice noodles in a thick gravy), but the condiment is usually a small saucer of cut fresh chilies or pickled green chilies in soy sauce. The fresh chilies are always red chilies, and sometimes bird’s eye chilies, or a combination of both. This condiment is really very simple, but to us Malaysian, it’s indispensable and what makes our noodle dishes so incendiary delicious—the spicy kick that accompanies every mouthful of the noodles, with an extra dash of very good tasting soy sauce. By the way, Malaysia produces some of the best soy sauce, but that will be another post. So back to my Malaysian-style fried udon. Udon is Japanese, but the Malaysian-style udon can be found at restaurants in Malaysia. In my recipe, I used fish cakes, which is a popular ingredient in many Malaysian noodle dishes. With some shredded cabbage, shrimp, mushroom, carrot, and the generous use of sweet soy sauce, this humble Malaysian-style fried udon takes me back to Malaysia. And the condiment of cut bird’s eye chilies gave me just the right amount of heat and extra flavors. It was extremely delicious and absolutely satisfactory. I love Japanese-style fried udon, which is cleaner in taste. But give me a choice, I’d always opt for this sinful version. Udon noodles are widely available in the US and everywhere now. 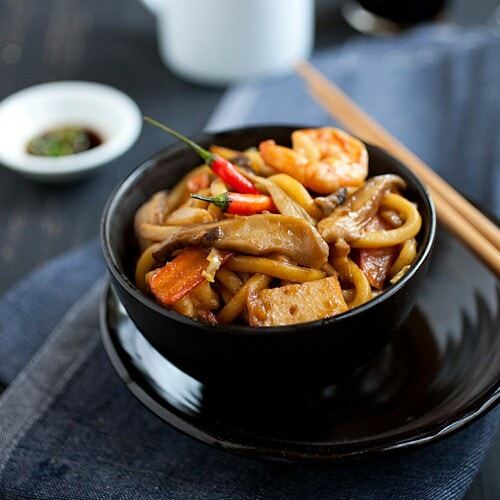 Try my Malaysian-style fried udon recipe and I bet you will instantly fall in love with it. Fried udon recipe, Malaysian style. Cabbage, shrimp, fish cake in a dark brown sauce. Serve with cut chilies and soy sauce. Easy fried udon recipe. Rinse the udon with cold running water, drained and set aside. 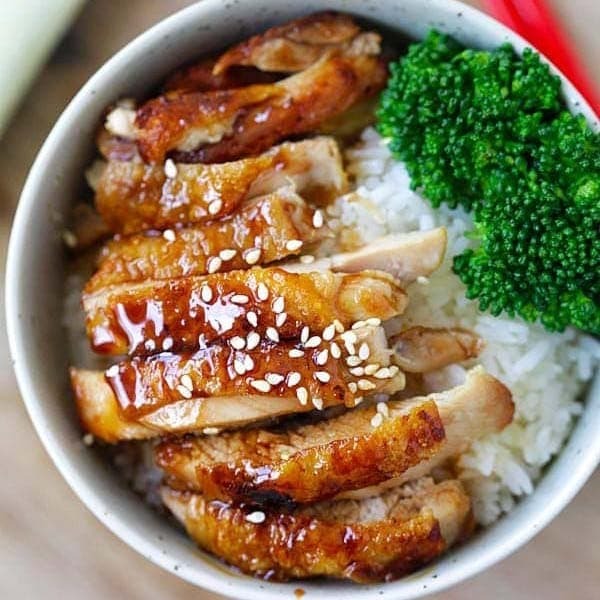 Mix all the ingredients in the Sauce in a small bowl, stir to blend well. Set aside. Prepare the soy sauce and cut chilies condiments in a small saucer. Just add some soy sauce to the cut chilies. Heat up a wok and add the oil (or lard). 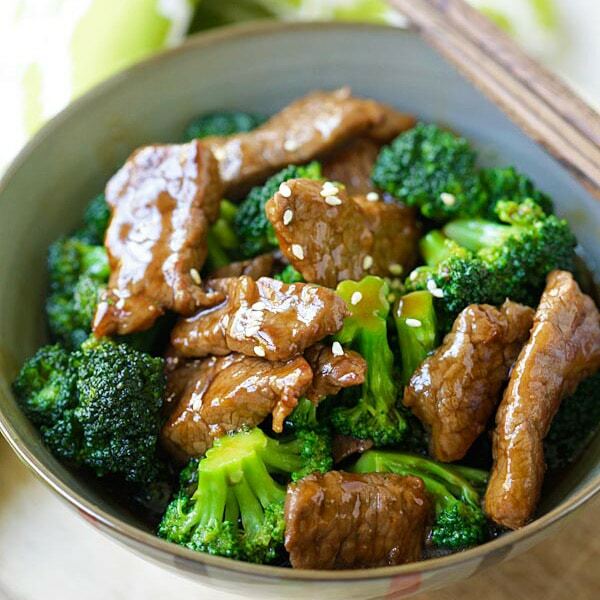 When the hot is fully heated, add the garlic and stir fry until aromatic. Add the shrimp and fish cake and stir-fry until the shrimp is half cooked. Add the mushroom, carrot and napa cabbage and stir for a few times. Add the udon noodles into the wok, follow by the Sauce. Stir continuously to combine all the ingredients in the wok. Let cook for a little bit, stir a few times and make sure the udon noodles are cooked through. Dish out and serve immediately with the cut chilies and soy sauce condiment. The dish should be a little wet as the sauce should cling to every strand of the udon noodles. It shouldn't be dried. Add a little water if it's become dry. If you can't find fresh udon, use dried udon. Cook it according to package instructions, about 80% cooked through before stir-frying. The Udon noodle I have seen in the market is dry kind. Do you mean to rinse the dried and uncooked Udon noodle in the running water and then drained? The Udon I have seen in a supermarket is dried kind. Do you mean to rinse the dried and uncooked noodle in the running water and then drained. Pls advise. You can get the “fresh” udons which comes in transparent packet. It usually comes with sauces too, but discard those. If you can only find the dry ones, follow the package instructions and cook it about 80% done before stir-frying. Just 1 person. My 2 1/2 year old son loves this recipe. I buy my fresh udon in supermarkets. They are quite widely available now. I love udon fried black pepper style! It’s one of the best ways to have them. Though in real life, I make mine similar to yours and only have the black pepper variety in restaurants. :-) So nice and chewy. This looks really good! But unfortunately, where I live, I have not been able to find Udon noodles anywhere! Is it possible to use other types of noodles? If do, which would you recommend? Sure you can use yellow noodles or any sort of thicker noodles. Hi Bee, thanks for this recipe. Made it for dinner last night – super easy, super delicious! Great that you love it. I would like to prepare this dish for 10 people. Do I just multiply by 10? I’ll be grateful in the event you proceed this in future. A lot of people can be benefited out of your writing. Cheers! Malaysian’s food is still the best. Dee-lish! I am from Ipoh now living in Vancouver and my mom is a Penang nyonya. 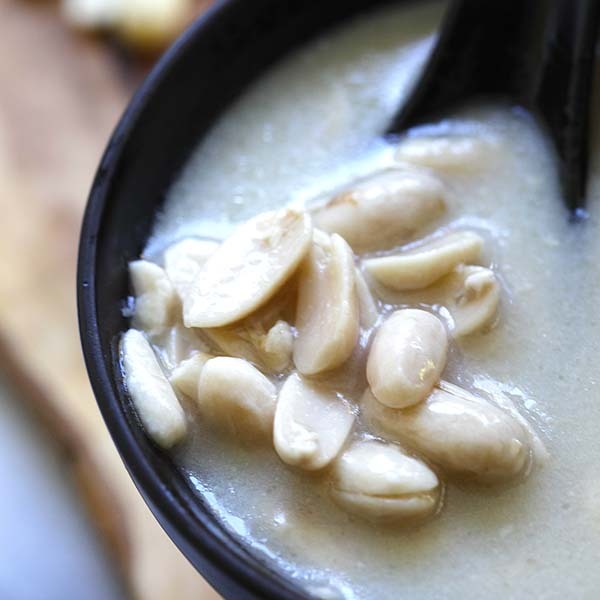 I have cooked many of your Malaysian and nyonya recipes and they are all awesome and authentic! Way to go Bee. This recipe is delicious! I throw in minced pork or whatever I have in the fridge with the udon noodles. Comes out great every time. Double thumbs up! :D Thanks for this delicious recipe! Hello! When should I add the mushrooms? Thanks! Hi! Can I replace the sweet sauce with something else as I don’t have any at home! Thanks in advance!